These kitchen taps have traditional designs, suited to traditional and country kitchens. These classic designs look great when paired with ceramic kitchen sinks and wood counter tops. We stock a wide range of traditional kitchen tap designs, with finishes such as Antique Brass and Old Copper. These unique kitchen taps will add an extra touch to your new kitchen. 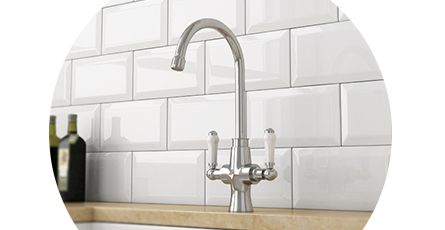 Our range of traditional taps have guarantees up to 20 years. Check each individual product page for details of its specific guarantee. These taps seem extremely solid and well-made. They also look good, and fit well into my very traditional style kitchen. Full marks!